For the New Year, I'd like to explore beer styles that are new to me. So far, I've reviewed a lot of IPAs, Pales Ales, and Winter Warmers. 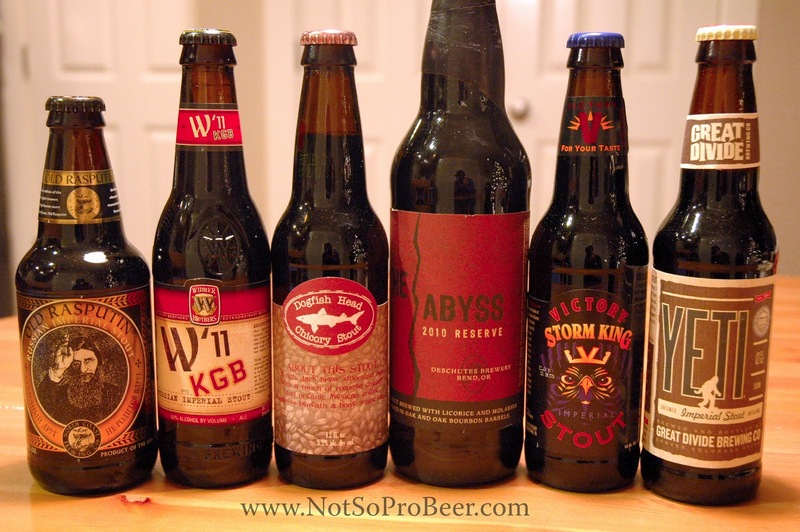 When I looked at the styles I reviewed in 2010, I was surprised to notice that I didn't review any stouts. Well, that's about to change! In the picture below, you may notice Dogfish Head's Chicory Stout. It's not an Imperial Stout. I accidentally placed it in the shot and am to lazy to take a new picture. I may do a different series on regular stouts. Or maybe I'll throw Chicory Stout into this round for a change of pace. We'll see. If you have any favorite Imperial Stouts, please let me know which ones. 3/28 update: I finally finished this series. I didn't know much about Imperial Stouts before I started, but now I know that I love this incredible style! They're so much depth in the darkness of these beers. I'm going to pick up some more of these and let them gracefully age. We'll see what happens in a year or three. I'm sure the result will be amazing. Beautiful line up of beers. My favorite RIS is Stone's, but Old Rasputin is not far behind. Thanks Jay. I wanted to to add Stone's RIS, but I couldn't find it. Now that I know it's good, I'll expand my search. Thanks for the tip! This is a great style. Lagunitas makes a nice one. This appears to be a popular style! Glad to see I have some of the best ones covered. I'll try to add Lagunitas' brew as well. Look forward to doing some tasting! I actually visited Oskar Blues when I visited Boulder in November. They make great beer! I have cans of Old Chub and Gubna in my fridge. I need to finish all my winter seasonals first! I'm ready for a change. I thought the Old Rasputin was good. A little on the bitter side. I'll keep trying the style. I'll be drinking Abyss this weekend. TenFidy and Lagunitas are my favs so far. I've really been enjoying this style. The Abyss was amazing. I could drink that one every day.